RUSH: Donald Trump has ’em all jazzed again, got ’em all wired up. You remember the joke that Trump told during the campaign, when nobody could find Hillary’s missing 30,000 emails. Trump says, “Hey, Russia, hey, Russia, maybe you can find ’em. If you find the 30,000 emails, let our media know.” He’s done it again. He has done it again, and they are beside themselves. And this is what I mean by stupid. This is just stupidity. This is just blockheaded stupidity. Here is Trump Saturday. Trump victory reception, I guess it was here in Palm Beach. Was he here this weekend? Trump was here this weekend? Well, no wonder. I should have taken the call. Damn. I didn’t know. Well, anyway, here’s what — no, that’s all I’m gonna say. Trump on Saturday had this to say about the new ChiCom president. RUSH: Maybe we’ll give that a shot someday. The Drive-Bys are beside themselves! The Drive-Bys believe that Trump actually now is longing to become a dictator. They really believe it. This is the point. I keep making the point, they’re not just doing this to have something to be outraged at Trump and televise it and get people worked up. They believe this stuff. That’s what’s so incredible. They have literally no sense of humor whatsoever. I watched… Trump had a great performance at the Gridiron Club Saturday night. This is generally an off-the-record event. It’s kind of like the White House Correspondents’ Dinner, except this one is much more elite. It’s much more exclusive. I think this one’s even white tie, and it’s always off the record. But Trump’s jokes leaked from there, and they were fascinating. I mean, Trump’s jokes in the Gridiron smoked Jimmy Kimmel’s jokes from last night. So I’m watching Hilary Rosen on CNN today. She’s reviewing Trump’s comment here about, “Hey, maybe we can do this dictator thing one day here, too,” and his Gridiron jokes. And Hilary Rosen — who’s a former Clinton fundraiser, policy person, like they all are at CNN. Do you realize everybody at CNN’s had something to do with the Clintons since the early ’90s? Anyway, Hilary Rosen said (paraphrased), “Trump… There’s just something wrong with Trump. Have you noticed…? Have you noticed that he can’t just tell a joke? He has to comment on his own joke. He’s like the performer and the reviewer at the same time. “Like, he’ll tell a joke and people will laugh! ‘Oh, you like that?’ Trump says. So he’ll tell another joke. I’ve never seen it before,” said Hilary Rosen. “I’ve never seen somebody that tells a joke and then reacts to the audience and talks about how great the joke was,” and people said, “So what?” She said, “The narcissism! The man is sick! He’s so narcissistic, he can think only of himself! He tells a joke, people laugh, and he has to comment on how much people love the joke.” I’m watching this, and I’m incredulous. Does this woman have no concept of performance, of performance personalities, of performance egos? Does she have…? No wonder these people didn’t understand Trump rallies. No wonder they didn’t understand Trump’s speech at CPAC. They have no sense. I’ve never seen a group of people so walled off from reality. I’ve never seen… I think the hatred they have for Trump has literally poisoned their minds. “Yeah, he’s such a narcissist, he has to comment after every joke. He tells a joke, and people laugh, and then he has to comment how great the joke was!” These people never paid any attention to other comics and comedians? I guess… They thought Barack Obama was funny, so that should tell you something. That’s the biggest dryball you’ve ever run into when it comes to comedy. I’ll give you some examples of these people freaking out over Trump wanting to become a dictator when we get back. GOODWIN: The Chinese leader is now in there for life, and he jokes about the fact, “That sounds pretty good. Maybe I could have that.” That made to be in the center of action is so great with him. I mean, Teddy Roosevelt they claimed used to want to be the baby at the baptism, the bride at the wedding, and the corpse at the funeral. This guy wants to be the president for life! RUSH: You hear the incredulity in her voice? It’s not even… It doesn’t even occur to her that he is joking. It doesn’t… The idea that Trump is kidding around and trying to be provocative doesn’t even occur to her, and we’re told this is one of the best writers America has ever produced, one of the best communicators we have ever had. It’s beyond me how people can be this obtuse! But it isn’t beyond me. I know exactly why. They’re blinded by hate. They have so much hatred; they are unable to see what’s really in front of ’em. Here’s John King at CNN. He was outraged. This is Sunday morning on Inside Politics. KING: What does it say when the president of the United States of the United States of America stands up at a fundraiser and some of his big donors start laughing when he says, “Maybe we should try that,” meaning a president for life. Forgive me. Is it just old school and I should forget about it? 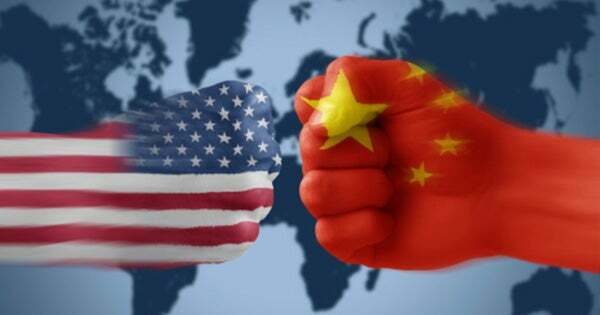 Isn’t it the job of the president of the United States and the United States government to say, “We view this as a step in the wrong direction; we view this as bad for the Chinese people”? RUSH: Mr. King, do you remember when Barack Obama’s administration agreed with the ChiComs that we have no business lecturing them on their civil rights violations because we have no room to talk? Barack Obama would not criticize the ChiComs. Barack Obama’s administration said we didn’t have the right to criticize the ChiComs because we have our own civil rights violations history, and who are we to be criticizing them? It was Barack Obama who spoke many times about being a king, what he could do if he were king, what he could do if he were dictator but that he wasn’t. But to take this seriously, that Donald Trump wants to be a dictator like the ChiCom leader is. Here’s Matthew Dowd. Matthew Dowd, when Bush was in the White House was a Republican strategerist and analyst. 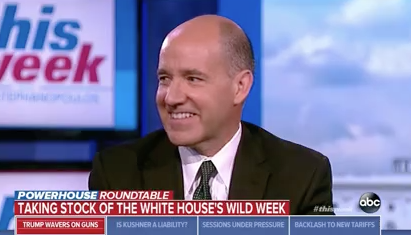 When Bush left the White House, Matthew Dowd went over to the other side. DOWD: The president after his comments about China saying we should copy their dictatorship, there seeing some senses maybe that’s what he wants. RUSH: Wow. So, yeah, what this means is that Trump is longing to be a dictator! He’s such a narcissist, he laughs at his own jokes, praises his own jokes — and now he’s longing for the kind of dictatorship that Xi Jinping has engineered for himself in communist China. This is something that just befuddles me. I mean, it doesn’t and it does. I just… These people… I’m try figure out, when did they become so stupid? When did this happen? Because unlike many of you, I think they believe this. I don’t think they’re posturing for their audience. I think they believe it. I think Joy Behar probably is the queen of this ignorance and stupidity. They believe this half-baked stuff. At the Oscars last night, Jimmy Kimmel was telling a joke about the reason Hollywood does movies they do is because they want to irritate Mike Pence. He’s telling the truth! He’s telling the truth. That is exactly why. It’s not new. They rejoice in irritating people who they think are cultural prudes and Christians and so forth. RUSH: We got the Thomas “Loopy” Friedman sound bite, January 20th, 2011. This is seven years ago, just over seven years ago. He’s on PMSNBC Morning Joe and they’re talking about Obama and the economy. Now, remember, Trump just tells this joke Saturday at a fundraiser at Mar-a-Lago or wherever it was. He was here in Palm Beach, I’m told. And he talked about the new ChiCom president — well, he’s not the new president. The current President Xi Jinping, who successfully got rid of term limits for the ChiCom president. So this guy is president for life in China. He’s as powerful as Mao Tse-tung was, or Mao Zedong, depending on your chosen preference or pronunciation. And of course the Drive-Bys have a fit about Trump longing to be and wanting to be a dictator. So back on January 20, 2011, Thomas Friedman gets a question from Joe Scarborough. And Friedman’s considered brilliant. Friedman, oh, my God, there’s never been anybody more brilliant on foreign policy. This guy is connected and if only he was doing something for real instead of just writing about it at the New York Times. He’s got an unassailable reputation and image on the left. FRIEDMAN: We had the president of China here. 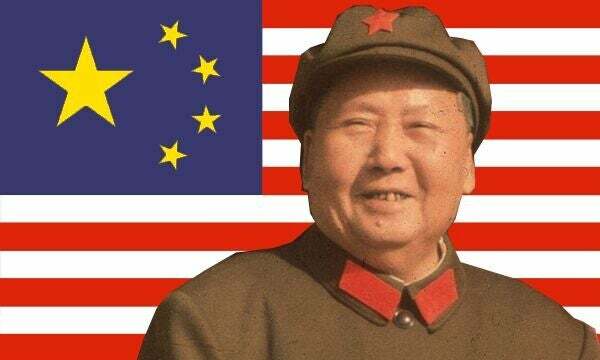 There’s only one thing worse, in my view, than one-party autocracy, the Chinese system, and that’s one-party democracy. Okay, so you got one party autocracy, at least if it has some vision of the future. But when you have one-party democracy, that is you have one party tried to do things and the other sticking a spoke in its wheels constantly, you can’t get anything big done, and that, to me, seems to be our really dilemma today. RUSH: If we searched, we would find even more. Thomas Friedman — and I don’t know if he said it on TV. I know he’s written it. He has written longingly of the Chinese way of doing things. Specifically he praised the fact that they’ve got a very small group of people that answer to nobody, and they can get things done without being held up by bureaucracy and that we needed to emulate that because Friedman thinks that he is one of the smartest people, the country ought to be in a group like that. That the ChiComs have this way of doing things. He would point on their advanced infrastructure and how well and how marvelous they’re building new things. I think it was a lead-up to the Olympics that were there, in fact, and he was marveling at how they get things done so rapidly and their modernizing compared to our economy, which is dragging, and there isn’t any infrastructure building. And he was praising the ChiCom system precisely because of its dictatorial powers, that it didn’t have to answer to any critics, that it didn’t have to go to Congress and negotiate with the other party and to get things approved. He’s written whole columns about this. And everybody applauds. They laud him and call him a forward thinker and somebody who’s light years ahead of everybody else in actually thinking of solutions to get things done. 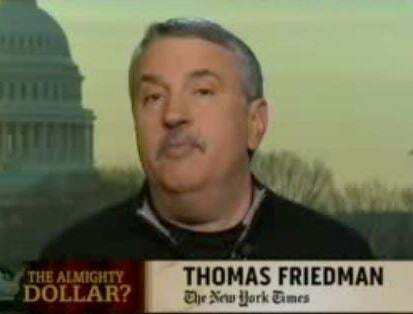 So when Friedman comes out and essentially praises communist-style dictatorships because there isn’t any opposition to them, therefore they can magically just get things done, of course he makes the assumption everything they do is for the good, and everything they do improves, and nobody is worried about the lead foreign policy columns for the New York Times endorsing and praising communism. And let Trump come out and make a joke about it and you don’t hear from Friedman on this, by the way, do you? I mean, Trump made a joke essentially out of something Friedman believes is a good thing. RUSH: Here is Thomas “Loopy” Friedman from a column in 2009, September 9, 2009. “One-party autocracy certainly has its drawbacks. But when it is led by a reasonably enlightened group of people, as China is today, it can also have great advantages. That one party can just impose the politically difficult but critically important policies needed to move a society forward in the 21st century. It is not an accident that China is committed to overtaking us in electric cars, solar power, energy efficiency, batteries, nuclear power and wind power. “China’s leaders understand that in a world of exploding populations and rising emerging-market middle classes, demand for clean power and energy efficiency is going to soar. Beijing wants to make sure that it owns that industry and is ordering the policies to do that, including boosting gasoline prices, from the top down.” Do you believe this? This is praising the ChiCom communist system! It’s praising it to the hilt! “One-party autocracy… when it is led by a reasonably enlightened group of people, as China is today … can also have great advantages. That one party can just impose the politically difficult but critically important policies needed…” This guy goes on to credit the ChiComs for solving everything! You can’t walk around in shanghai without a mask on your face because of the pollution! And who was it that brought gas prices down but the United States of America with our own domestic production? The ChiComs and gasoline prices? The ChiComs and wind power? The ChiComs and solar power? Why, the ChiComs are gonna solve climate change. The ChiComs are gonna solve human rights violations. The ChiComs! All because they have “an enlightened group of people that can just impose important policies needed.” And that’s how Friedman sees himself. He sees himself as a member of one of these enlightened groups that could just dictate, could just impose things. Not be delayed by the messy, dirty inefficiencies of democracy. He believes it, wrote about it, was heralded when he did. And, by the way, you go back to this other comment that he made in the sound bite. Uh, dah dah dah… Oh, no. It was Scarborough’s question. “Mr. Friedman, is there anybody who could reinvest in America like you’ve said and transform this economy? Clinton couldn’t do it. Bush couldn’t. Is there anybody that can?” He’s asking about Obama. Who has done it? It would be Trump who has done it! It would be Trump who has revitalized the economy! It would be Trump who has overseen an economic revival of sorts and expressly due to specific policies. Not Obama, who told us that the new was the decline, that America’s best economic days were behind us. (summarize) “It’s now a global world, and we cannot operate independently from other nations as such. There is a new era and is an era where we must manage the decline.” And in one year, eight years of putrid stagnation have been erased and eliminated. And it wasn’t just Friedman. December 1, 2011, on this program we had a sound bite from Andy Stern. Do you know what Andy Stern is? He was the former head at the time. This is seven years ago. Back then, he was the former head of the SEIU, the Service Employees International Union. He was one of Obama’s big fanboys and vice-versa. Obama loved the SEIU. They were massive political players, massive political donors. He wrote a piece called, “China’s Superior Economic Model.” He wrote a column. We were commenting on it on that show on December 1st, 2011. The biggest myth is that liberals care about people. The biggest myth in politics is that liberals own compassion.